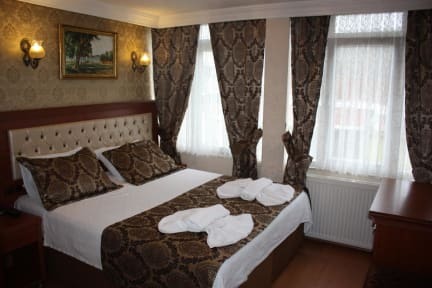 Big Apple Hostel & Hotel is located in the old city of Istanbul and only a few minutes from the Blue Mosque, St. Sophia, Topkapi Palace, Underground Cistern and Historical Turkish Baths, 10 minutes to Grand Bazaar and 10 minutes drive from Taksim Square. Big Apple Hostel is youthful, high-style, and high-tech. Our rooms are simple, stylish, and inexpensive. We offer convenient accommodations for the hip and spendthrift traveler. Depending on lifestyle and budget, guests can choose a bed in 4 Bed Female Dorm, 6 Bed Mixed Dorm, 6 Bed Female Dorm, 6 Bed Female Dorm Ensuite and 14 Bed Mixed Dorm or Private Double/Twin Room Ensuite, Private Triple Room Ensuite and Private Family Room Ensuite. Private rooms with private baths, wide screen TV with DVD player, air-conditioner, complimentary wireless Internet, and hair dryers.Shared rooms with shared baths located on the same floor. All shared rooms have air-conditioners, storage lockers under beds. You can meet people from all around the world in our common area on the roof top terrace where is serving free breakfast as well. 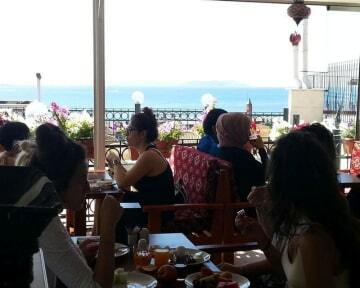 You can sip your drinks with overlooking to Sea of Marmara. We have a free travel advisory and know just what you need to have the best holiday ever !! We organize BBQ party on our rooftop terrace, followed by a pub crawl to Taksim (the centre of nightlife and live music in Istanbul) every week.